With the holiday season gearing up, it might be time to wise up and let someone else handle the cooking so you can truly enjoy the time with loved ones and friends. Whether you’re hosting a big holiday bash or a small family gathering, and whether you need full service from start to clean-up or just a few drop-off items to help ease your load, these caterers have got you covered during the holidays or any time of the year! For over 25 years, Hel’s Kitchen Catering has provided some of the most personalized and engaged catering solutions throughout Chicagoland and the entire North Shore. Whether you are catering for the masses or an intimate family dinner or simply need some appetizers or breakfast dropped off, they do it all with great service to boot. You can choose from various pre-packaged menus including special holiday and seasonal offerings or create your own, the options are truly endless. Gourmet Food Works is the catering side of The Picnic Basket Restaurant in Libertyville, serving Chicago and the northern suburbs since 1980. They have several unique but simple menu ideas that are practical yet economical, and can accommodate special requests/themes. They are known for their high quality boxed lunches but they do a whole lot more including on site BBQ. Since 1980, Catering by Michaels has been committed to providing uncompromised quality, impressive presentation, and attention to even the smallest details. Choose from full service where they fully prep and cook on-site and even handle the dreaded cleanup to pick-up and delivery options based on pre-designed menus (including vegetarian, vegan, and gluten-free and other specialty items) with à la carte pricing for simple ordering. You can have it delivered hot and ready to eat, or cold with customized heating and serving instructions. Grateful Bites is a full service catering and personal chef company. They cook from scratch using the freshest and most locally sourced ingredients. What makes them unique, is their mobile wood burning oven! They offer a multitude of foods that can be prepared in the oven, including but certainly not limited to their delicious Neapolitan style pizzas. All of their menus are custom to fit each client’s needs. Chef Matt and the entire team provide great food and great service from start to finish. 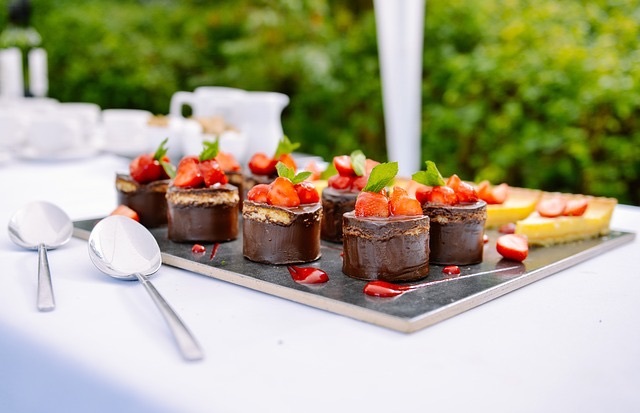 FIG Catering prides itself on being a little bit quirky and out of the box, but that doesn’t mean they don’t deliver on taste, service and attention to detail. Their sole focus on small event catering services (2 – 150) enables them to offer clients more flexibility and creativity. Local or organic? Vegetarian? Ethnic? Exotic? They do it all with an extra effort in making responsible decisions to decrease waste, reduce their carbon footprint, and use local resources. They provide a full range of catering services to help your event go off without a hitch as well as drop-off platters for those small gatherings that might not require staff or rentals. An Apple A Day, the catering arm of Meg’s Café in Glencoe, was founded out of a love for gourmet foods and has been serving Chicago’s North Shore and beyond for over 20 years. They pride themselves on using only the freshest ingredients, creating flavorful foods with gorgeous presentation, and exceptional service. An Apple A Day can create any type of menu to meet your catering needs and vision. Services include full service or drop off catering, floral design, full service rentals, linens and event staffing. Green Cuisine specializes in home and corporate catering in the Chicagoland area. From boxed lunches and dinner parties with a few close friends to festive cocktail parties, Green Cuisine is committed to serving remarkable food with exceptional service each time. They offer full service catering as well as ready-to-eat drop-off catering services all while utilizing only the freshest of ingredients. AOK Gourmet offers a variety of fresh, homemade food to accommodate any type of social catering need for either takeout or delivery. Owner Andrew Kalish grew up on the North Shore, worked at various local kitchens and thus has a true understanding of his clients’ needs. They are happy to tailor any menu but also offer plenty of a la carte options that are affordable and can be prepared with 24-48 hours’ notice! Makes ordering simple and convenient! Check out their special holiday menu. After the successful launch of Froggy’s French Café back in 1980, Froggy’s Catering was created to meet the demand for diversified services. The catering arm is overseen by Thierry Mace, who combines his stellar international culinary career and “calming influence” to meticulously plan and execute events to meet clients’ needs, desires and beyond. The food is elegant and the service and attention to detail is always first rate. Catered by Design enjoys an excellent reputation for exquisite food and exemplary catering services. They are often listed as a preferred caterer at many North Shore venues and there is a reason why. Regardless the scale of your event, the food is delicious, and the customer service is impeccable. From drop-off to full service, they do it all and do it with style and grace. SBR Events Group is a collection of 3 of Chicago’s leading special event brands all working collectively together to provide clients with proven excellence in culinary services, design, and production for their special events. True Cuisine catering offers chef-inspired, custom menus featuring fresh food made from scratch with local ingredients. Dishes are artfully prepared with a sophisticated presentation. Sweet Baby Rays catering is all about fun. They use rustic cooking techniques such as open fire grilling to bring out delicious natural flavors and provide exceptional takes on classic comfort food. And if you are so inclined, you can take advantage of Meetinghouse, an award-winning design and production team supported by a 32,000 square foot design center filled with décor, event furnishings, lighting, fabric, draping, audio-visual equipment and a floral studio. It’s a one stop shop for all of your catering needs. Based in Lake Bluff and owned by Chef Catherine O'Meara, Heller Catering offers customized menus composed of fresh, organic, seasonal ingredients. The creativity, presentation and customer service are exceptional. From intimate in-home lunches to full service weddings, they handle it all with ease and professionalism. And the food, “is to die for.” Happy customers have said they find themselves inventing reasons to host a party just so they can use Heller Catering again! 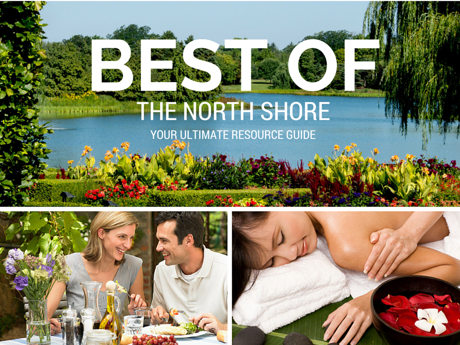 Check out the Best of the North Shore: our favorite restaurants, stores and service providers all in one place! 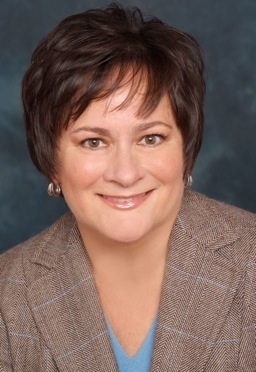 We are a top team of real estate agents specializing in the lakefront communities of Evanston, Wilmette, Winnetka, Kenilworth, Northfield, Glencoe, Highland Park and surrounding areas. If you would like to schedule a buyer or seller consultation with the Come Home North Shore Team, please give us a call at 847.881.6657 or send us a note here.